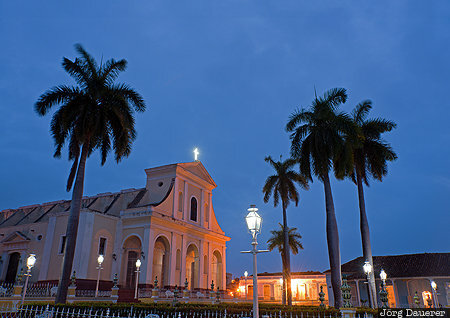 The Church of the Holy Trinity (in Spanish: Iglesia Parroquial de la Santísima Trinidad) surrounded by palm trees and illuminated street lamps at the blue hour before sunrise. Trinidad is in the province Sancti Spíritus in the south of the Caribbean island of Cuba. This photo was taken in the morning of a cloudy day in March of 2016. This photo is part of the exhibition Blue Hour (October 2016). This photo is in the Photo Calendar "Kuba". This photo was taken with a digital camera.